While accepting a special recognition award from Dustin Hoffman at the UK’s National Television Awards – which was broadcast to millions last week – the comedian was asked how he was coping with the degenerative condition, and responded with a moving, honest account. “It’s managing me,” he said. “It’s kind of weird; it creeps along and crawls along. It’s the first thing I think about in the morning, so I try to make the second thing I think about more interesting.” The Scottish comedian who was diagnosed in 2012. The award paid tribute to his 50-year career in comedy, and actor Dustin Hoffman flew in especially from the US to present the special honour to his friend. 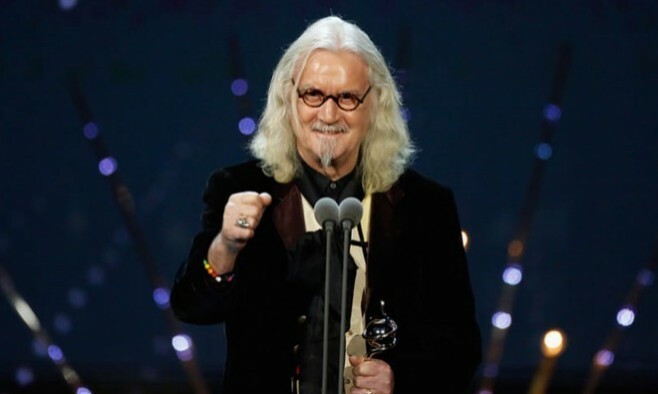 Sporting traditional tartan trousers, Connolly said that his career had been a “grand old rock and roll all the way” and he left the stage to a standing ovation.